Incremental length gauges from HEIDENHAIN play a role in incoming goods inspection, fast dimension checking during production, statistical process control in production or quality assurance, or in any application where fast, reliable and accurate length measurement is required. Their large measuring lengths are a particular advantage: whether the part measures 5 mm or 95 mm, it is measured immediately with one and the same length gauge. HEIDENHAIN length gauges are available with measuring lengths of 12 mm, 25 mm, 30 mm, 60 mm or 100 mm so that you can measure very different parts in one measuring setup and avoid frequently changing setups with expensive gauge blocks or masters. The high accuracy specified for HEIDENHAIN length gauges applies over the entire measuring length. Whether the part measures 10 or 100 mm, its actual dimension is always measured with the same high quality. The high repeatability of HEIDENHAIN length gauges comes into play during comparative measurements, for example in series production. HEIDENHAIN length gauges are built for an industrial environment. They feature consistently high accuracy over a long period of time as well as high thermal stability. They can therefore be used in production equipment and machines. HEIDENHAIN ACANTO length gauges operate with absolute measurement with ranges up to 30mm. The measured value is available immediately upon switch on, so no reference procedure is required. Destruction-free, non-tactile measuring principles are common, but these mostly optical measuring methods cannot match the precision of tactile encoders with photoelectric scanning. The great challenge is the development of a measuring device that combines high accuracy with destruction-free measurement. HEIDENHAIN has solved this problem with its new METRO 1281 MW length gauge. It features an extraordinarily low measuring force curve between 0.01 N and 0.07 N over its entire 12 mm measuring range. The new length gauge therefore provides access to new fields in tactile and high-accuracy metrology. Now it is possible, for example, to calibrate very small gears, various glass objects and wafers, or products in medical technology. 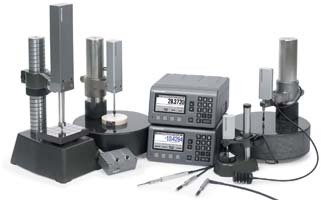 This rules out the undesired deformation of workpieces by the measuring device that can falsify measuring results or even damage or destroy the workpiece. Transparent materials that repeatedly present difficulties for optical methods can likewise be measured simply and exactly with the METRO 1281 MW from HEIDENHAIN.